Examine your assumptions, emotions, and background before choosing what to share with others. Internally, we process what we observe, making sense of it, and then select an action or response. Sometimes, this process happens very quickly. We may feel we don’t have a lot of choice about our actions, particularly when we have a strong emotional reaction. 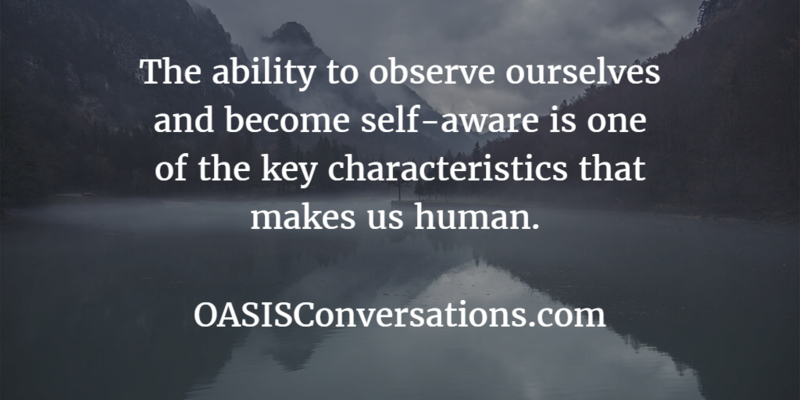 The ability to observe ourselves and become self-aware is one of the key characteristics that makes us human. We have the capacity simultaneously to make assumptions about an observation, experience emotions, and also become aware of what is going on. It is as if we are in a theatre, shining a light on the actors and noticing their thoughts and feelings. When we notice our excitement, some part of us is feeling excited and another part is noticing this emotion. Becoming aware is a critical tool for managing and supporting ourselves to engage in valuable conversations. When we are aware, we are more free to make a choice about how we will respond and what we will share with others. According to the Harvard Business Review, seventy-five members of Stanford Graduate School of Business’ Advisory Council almost unanimously identified self-awareness as the most important ability for leaders to develop. Sadly, many leaders, especially those early in their careers, believe they are working so hard that they don’t have much time for self-exploration. Other research on emotional intelligence identifies self-awareness as a key distinguishing factor in determining success in many areas. The simple process of asking yourself, “based on what I am observing, I assume…, I feel…, Because…” will support you in greatly increasing your awareness and leadership capacity. One challenge is to remember that our emotions are influenced by our thoughts. Sometimes we fail to realize that our thoughts influence our perceptions, emotions, and experiences. For instance, when we are absorbed in watching a really good movie, we get so engaged that we feel like the experience is real. Our thoughts determine how we feel about a situation. If you think, “I am going to fail this assignment,” you are likely to feel stressed and worried. However, if you think, “I am going to be successful,” you are likely to feel energized. Sometimes, our first instinct is to try to blame external circumstances for how we are feeling. We seem to forget that our thoughts are influencing our emotions and perceptions. Let’s try a simple experiment. Imagine you are in an airplane and looking forward to arriving at your destination. You hear an announcement that due to heavy air traffic, your plane is going to be late (this is your observable data). How do you respond? You may think, “I hate flying. Why are there so many delays? This is unfair.” You may notice your emotions of anger, frustration, and worry. Or you could think, “This delay gives me time to read a book, complete some work, finish a movie, do some thinking, or listen to my favorite music.” Using this second approach, you may feel peaceful and appreciate the time to yourself. The observable data— the delay of the airplane— remains the same. Your thoughts and declarations about the situation, however, influence your subsequent emotions. The Consortium for Research on Emotional Intelligence in Organizations demonstrates that those who are most aware of their thoughts and emotions are more successful than their peers. In many studies, people say they prefer to work with leaders who are self-aware. In fact, this kind of awareness, which is part of emotional intelligence, has been found to be a greater indicator of success than cognitive intelligence in study after study. When we notice our sensations and emotions, we are more at choice to examine our thoughts and reflect on how we want to respond. Our thoughts and emotions are messengers that support us in taking action. Because thoughts and emotions occur so quickly, we often react and move directly to taking action based on our perceptions. If we make it a habit to check-in with ourselves and notice our thoughts and emotions, we will be more at choice about how we want to act and relate to others. Since most of us were not taught to pay attention to our thoughts, emotions, and background, it initially takes practice. However, once you get in the habit, it is not hard. Often, you will first notice your sensations or feelings; then you notice your emotions, and finally, you can review your thoughts. Meditation or mindfulness is one way to practice regularly paying attention to our thoughts and emotions. A lot of research supports the health and wellbeing benefits of mindfulness. To experience the benefits requires noticing your breath and your thoughts and emotions and labeling them; then you will be more aware and better able to act from a place of choice. This entry was posted in Self Awareness by Ann Van Eron. Bookmark the permalink.